We really enjoyed our trip to Northern Oregon’s Columbia River Gorge, especially our stay at the Columbia Gorge Hotel, one of the most historic hotels in the American West. The Columbia Gorge Hotel is perched atop cliffs next to a waterfall with beautiful views up and down the Gorge. The grounds are impeccably landscaped like a giant living bouquet over at least an acre with dozens of hanging pots with wildflowers, pretty lawns and bridges, and paths through the trees. 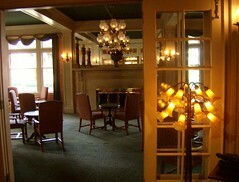 Pictured is the lounge. The dining room overlooks the gorge and often ranks among the finest of Oregon’s fine dining establishments. Presidents Roosevelt (FDR I think) and Coolidge stayed here.